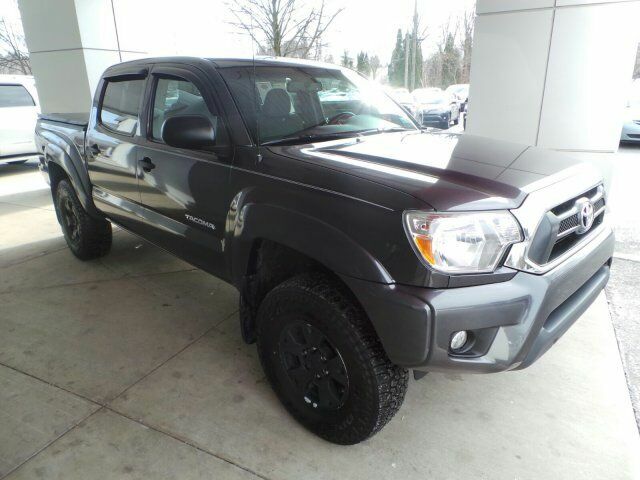 This 2013 Toyota Tacoma is equipped with luxury car-level features. Vehicle stability control, Variable-assist pwr rack & pinion steering, Traction control, Tire pressure monitor system. Tilt & telescopic steering wheel, Sun visors w/front passenger vanity mirror, Smart stop technology, Side-door impact door beams, Rear leaf-spring suspension w/staggered outboard-mounted gas shock absorbers, Rear door child safety locks, Rear bulkhead storage, Pwr windows, Pwr ventilated front disc & rear drum w/rear tandem booster brakes, Pwr mirrors, Pwr door locks, P245/75R16 mud & snow tires, Overhead console -inc: maplights, sunglasses storage, Multi-reflector halogen headlamps, LATCH lower & top tether anchors for front passenger seat & all rear seats, Gauges -inc: tachometer, coolant temp, fuel level, LCD display, tripmeter, digital clock, Full-size spare tire, Full carpeting, Front & rear stabilizer bars, Front & rear side curtain airbags. ALG Best Residual Value, KBB.com Best Resale Value Awards, KBB.com Brand Image Awards. As reported by KBB.com: If you're looking for a proven pickup that is as capable as it is stylish, the 2013 Toyota Tacoma deserves your attention. Nearly as capable as a full-size pickup but without the extra bulk and fuel consumption, the Tacoma fits a lot of needs. Stop by Joel Confer Toyota located at 120 E Clinton Ave, State College, PA 16803 for a quick visit and a great vehicle!